Western blot analysis of extracts from COS cells, mock transfected or transfected with human Frizzled5, using Frizzled5 Antibody. 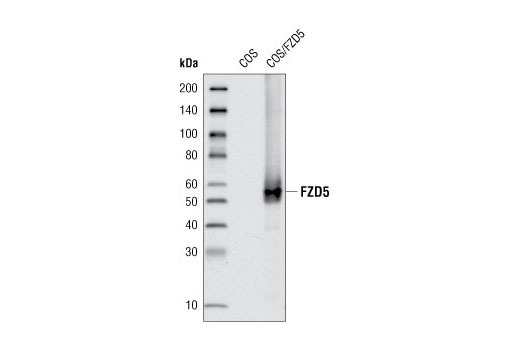 Frizzled5 Antibody detects transfected levels of total frizzled5 protein. Polyclonal antibodies are produced by immunizing animals with synthetic peptide corresponding to the amino acid sequence surrounding Ala549 of human frizzled5. Antibodies are purified by protein A and peptide affinity chromatography.